Most little girls had lemonade stands. Jessica, on the other hand, had jewelry stands. Jessica grew up in San Antonio, Texas as the daughter and granddaughter of women who loved style and fashion. Some of Jessica's earliest memories are of digging through her grandmother's treasure trove of jewelry curated from adventures around the world. At age 16, Jessica traveled to Kenya and witnessed what life was like for children growing up without clean water, safe housing or loving families – and something began stirring in her heart. She knew then she wanted to spend her life creating opportunity for the poor. 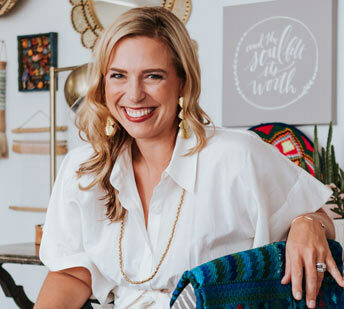 Today as Co-CEO of Noonday Collection, Jessica spends her days inspiring others to live lives of purpose. She travels across the United States and around the world, training Ambassadors to be stylists and storytellers and visiting Artisans to encourage them in their work. When she's off-duty, Jessica loves spending time with her husband Joe and their three kids, Amelie, Holden and Jack. Looking for an inspiring, passionate, and engaging speaker? Book Jessica for a podcast or event at jessicahonegger.com. When I started Noonday Collection, one of the first things I noticed was that fashion crosses all cultural boundaries. This summer when I visited the Artisans who create our paper bead jewelry in Uganda, one of the first things I noticed was their hair, featuring elaborate weaves and brightly colored braids. Earning a sustainable income means that not only can the women put their children in school – they can also go to a hairstylist! When I travelled to Guatemala, I noticed that women were wearing traditional tops – called huipiles – adorned with embroidered birds. I had never seen this before! When I asked one of the Artisans about the bird motif, she basically replied that birds were latest trend in her village. No matter where you go, women love feeling beautiful and expressing themselves through style. If you have fun with fashion and you want to make an impact in your community and around the world, we would love for you to host a Trunk Show Show or join as a Noonday Ambassador." Fashion can create connection between women all around the world. And combining fashion with hospitality is a powerful way to engage our communities and create opportunity around the world.